The Long Walk is to the Navajo what the Trail of Tears is to the Cherokee. Troubled relations between the U.S. and the Navajos brought on a wicked removal in December of 1863. 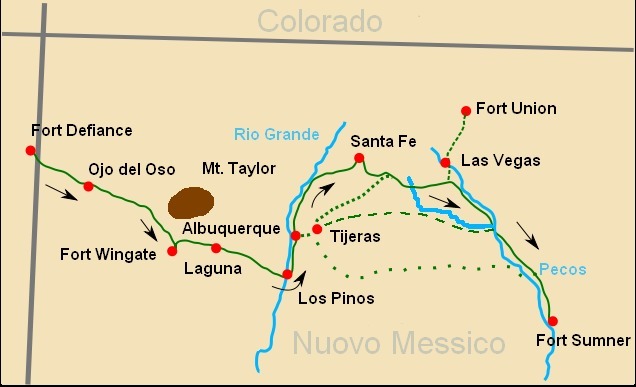 Earlier in the year, the United States government had sent in Christopher “Kit” Carson to remove the Navajos from their homeland of Fort Sumner, New Mexico. He burned their villages, starved them, and took them as slaves until they surrendered in the middle of winter, the worst time to begin a 400+ mile journey from points in Navajo country to Fort Defiance, Arizona and from there to Fort Sumner, New Mexico. Cold made the difficult journey worse, but the Navajos suffered the most spiritually and mentally because they were uprooted from their homeland. They called their home The Four Sacred Mountains due to the spiritual qualities it possessed for them. Their hardships resulted in the death of around 200 Navajos on the journey. Some died from their conditions. Others were shot for being pregnant, old, or slow. The Navajos were not allowed to bury their dead. More than 8,000 Navajos made it to Fort Sumner where they experienced continued starvation, slavery, prostitution, and disease at the hands of their enemy. It is estimated that more than 3,000 Navajos died at Fort Sumner by 1868. That spring, General Sherman of the United States of America sent a survey report back to the government and reported only 7,111 Navajo survived at Fort Defiance, and that he was convinced, “that the Navajos [would] never be contented to remain” at any place other than their homeland. On August 28, President Andrew Johnson signed a treaty that allowed the Navajo to return to their home at Fort Defiance. One Navajo woman said, “When I tell my grandchildren about the Long Walk, they don’t believe me. I tell them that they wouldn’t be as they are today if their ancestors hadn’t gone through the confinement and even died of hunger.” The Navajos are proud of their ancestors for being strong and surviving against the odds. They recognize that this type of horrible event should never happen again. 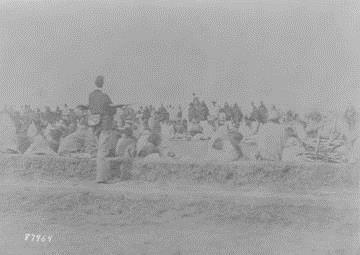 Navajos Under Guard After Forced March to Fort Sumner, New Mexico, ca. 1864 ~ Source: From Native Voices. “1864: The Navajos begin ‘Long Walk’ to Imprisonment,” available at www.nlm.nih.gov/nativevoices/timeline/332.html. Map of Primary Long Walk Trails ~ Source: Dollman, Darla Sue, from Wild West History. “The Navajo Long Walks, the Bosque Redondo, and the Long Walks Home,” available at wildwesthistory.blogspot.com/2012/10/the-navajo-long-walks-bosque-redondo.html. The Four Sacred Mountains ~ Source: Engel, Jordan, and David Gross, from The Decolonial Atlas. 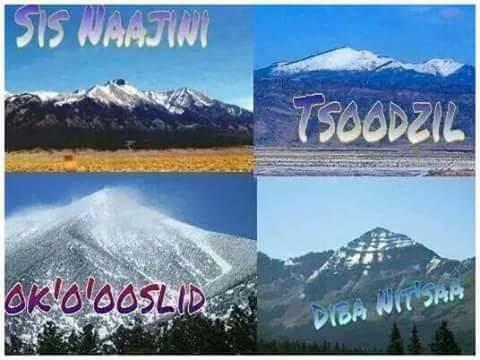 “The Four Sacred Mountains of the Navajo,” available at decolonialatlas.wordpress.com/2015/02/22/the-four-sacred-mountains-of-the-navajo/. Maddie Pettit, Brigham Young University, “The Navajo Trail of Tears from Fort Defiance to Bosque Redondo,” Intermountain Histories, accessed April 19, 2019, https://www.intermountainhistories.org/items/show/191. Cuch, Forrest S., and David Begay. “The Navajos.” A History of Utah's American Indians, edited by Forrest S. Cuch, Utah State Division of Indian Affairs, 2003, pp. 279–286. Danver, Steven L. “Indian Wars and Woes: Status Report on the Condition of the Navajos.” Defining Documents: The American West (1836– 1900), Grey House Publishing, 2014. pp. 111. Donovan, Deborah. Native America and the Question of Genocide. Chicago, IL: American Library Association, 2014. Available at go.galegroup.com/ps/i.do?p=GPS&sw=w&u=byuprovo&v=2.1&id=GALE%7CA366459623&it=r&asid=2257c07537910b146b7593570bd441d0. Roessel, Ruth. Navajo Stories of the Long Walk Period. Tsaile, AZ: Navajo Community College Press, 2002.